Each large new coal power plant (1000MW capacity) is expected to kill around 600 Indonesians a year. If they opt for coal – as looks to be the case – Havard will probably have to revise up that 28,000 premature deaths figure. The thing that’s killing them all is the pollution particulate PM2.5 which is so small it can get into the lungs and bloodstream and cause all kinds of cardiovascular and respiratory diseases. PM2.5 is made up of mix of pollutants like nitrogen oxide (NOx) and sulphur dioxide (SO2) which coal-fired power plants emit. The Harvard research is basis of a Greenpeace report called The Human Cost of Coal Power, in which a detailed breakdown of the projected deaths is provided. 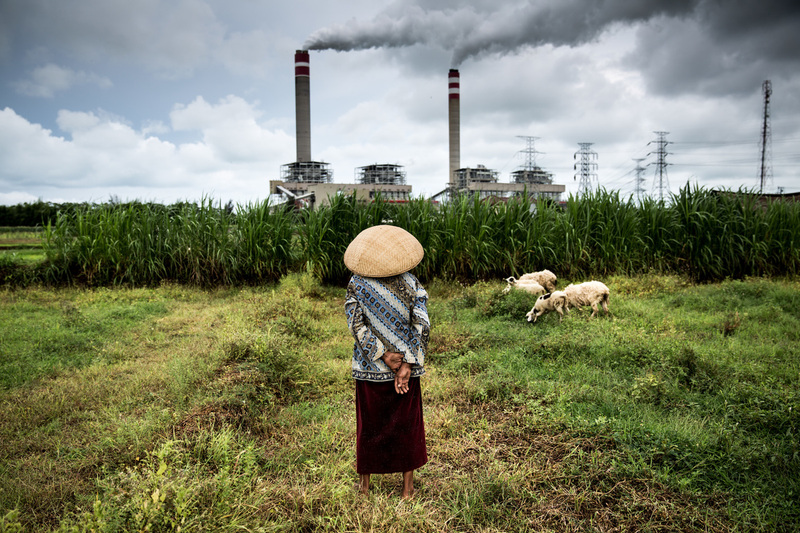 With all those currently under construction coal plants, the number dying inside Indonesia and out from heart disease, lung cancer, and strokes will triple, with obstructive pulmonary disease claiming nearly four time as many lives. Acute respiratory infections are expected to kill around 400 young children a year. And Indonesia is planning on massively increasing its coal capacity further, though the report hasn’t got any concrete figures on this latest expansion. President Jokowi is planning for 35GW of new power plants by 2019, 22 of which will probably be coal-fired (62%). Coal accounts for around 50% of Indonesia’s energy-related SO2 emissions, 30% of PM10 emissions, and 28% of NOx emissions, according to 2008 data. Those figures are probably much higher now since coal use doubled from 2008 to 2014, and its share in the energy mix increased from 24% to 35%. And, as the graph above illustrates, Indonesia has incredibly lax air pollution standards — a very weak 150μg/m3 daily ceiling for PM10 and no limit at all for PM2.5. Smog-stricken China has standards that far outstrip Indoensia’s. Plus there’s almost no air quality monitoring. Instead the historically coal-exporting country will use the fossil to fuel its own power sector, the capacity of which grew 78% from 1993 to 2003 — and nearly half of that came from coal.